In Japan, paddy fields located adjacent to rivers are a familiar landscape in rural areas, and they are divided from rivers by soil banks. Soil banks are easily breached by overtopping in floods. Previously, although soil banks were often breached in many locations, inundation in paddy fields was not necessarily a serious disaster, but it was rather positively accepted as a nutrient supplier to paddy fields. In addition, bank breaches at several sites decreased the flood discharge in a river and disasters were distributed into smaller scales. Over time, land use has changed from paddy fields to residential areas where inundation is obviously a disaster, and thus, banks have been improved to be safer against higher flood stages than what they used to be. Recently, more severe rainfall due to climate change and subsequent flooding has happened, and more serious damage has been brought by limited bank failure. As a result, limited bank breaches occur as concentrated drastic events. The damage is brought about not only by inundation, but also and more seriously by sediment balance in paddy fields: overflow from a river brings a larger amount of sediments into paddy fields such that rice plants are buried by them; in other cases, soil suitable for rice paddies as well as rice plants themselves is washed away by rapid flow from the river forming deep scour holes. 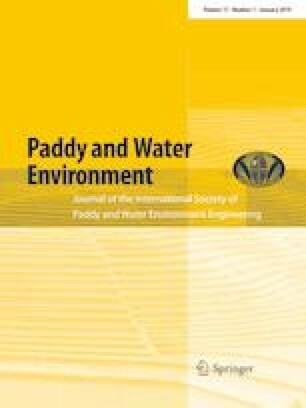 The above-mentioned phenomena can be understood by small-scale laboratory experiments and numerical analysis by applying a two-dimensional hydraulic model for depth-averaged flow with a proper sediment transport model for the whole river-bank-paddy area. By using an analytical model, several discussions become possible: For example, locations of retention ponds can be designed to avoid bank breaches accompanying scouring and sedimentation during severe floods.